If you are using traditional cubemap environment maps you get nice reflections and refractions, but they are static, as they are usually defined by a single texture read from the disk. The problem is quite similar to the FBOs in OpenGL, whereas an FBO could act like a framebuffer render target, and the attached textures could be bound to be read from without the need to copy back the contents of the backbuffer. FBOs and cubemaps can be combined, unfortunately it’s not really intuitive how to do this. Here are my notes on the problem, hope they might help someone else ... From shader version 4 on, (OpenGL 3.0+ I think), it is possible to use the geometry shader to write all sides of the cubemap in one draw call, by using layers. Unfortunately I was not able to try that (fix your damn video drivers, Apple!). The method I use takes a bit longer, but works just as well and on older hardware. As each cubemap update contains 6 calls to render the whole scene, it’s a good idea to only update it if needed. Additionally, make sure the cubemap’s resolution is not too high -- it does not need to be anyway. 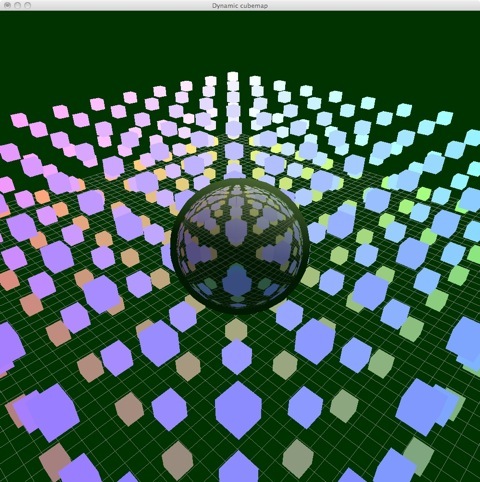 The cubemap might be centered on an object, and provide only reflections/refractions for a single object. In that case, it should be updated when the object moves. 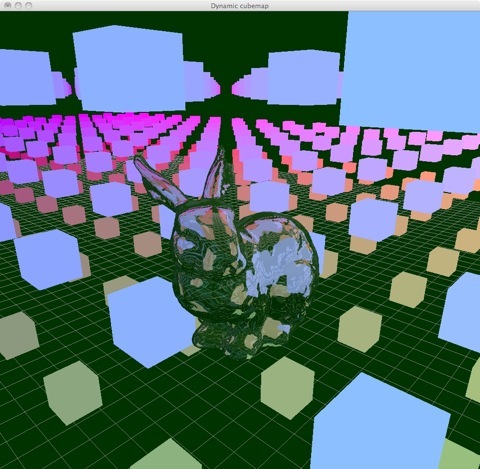 Alright, here’s the commented code on how to create FBO-cubemaps in OpenGL. And here’s the method on how to begin rendering to a specified cube face. 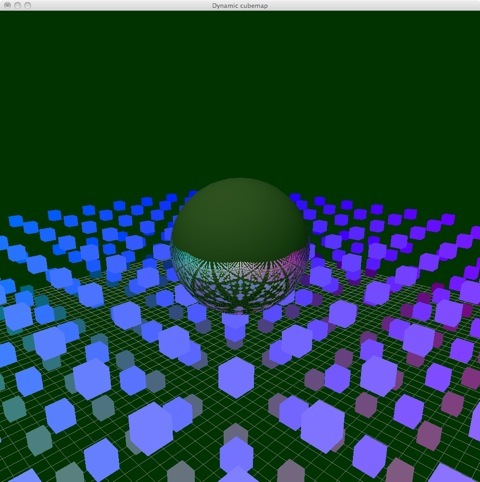 Assume it has a Vector3 variable that contains the world position for the center of the cubemap. There were some problems with the cubemap being upside-down. You can correct for this either by mirroring the texture matrix, or passing some (0,-1,0) up vectors in the gluLookAt function. If you have set up everything and are ready to draw an object. If you have a chain of transformations you start at the identity but instead of applying gluLookAt or something similar, you keep the matrix to the identity. After that you just mirror every operation on the modelviewmatrix also on texture matrix 7. Please note that the matrix operations have all been deprecated since OpenGL3, however it’s still quite convenient if you want to ‘just test something’. The proper way would be to pass all of your matrices directly to the shader. In that case you would probable have separate model and view matrices anyway. At that stage we have finally the model matrix passed to the shader and we are able to perform all lighting calculations in world space. The vertex shader’s responsibility is to just calculate the needed interpolated world coordinates. First, we have a very bare-bone material description, just containing a diffuse color, some [0..1] bound values for transparency and reflectivity. Because we are now dealing in world space, we have to explicitly pass the world coordinates of our camera. We also define a single point light for diffuse lighting. The first thing to do is calculate some normalized rays for the light, the normal and the viewing direction. 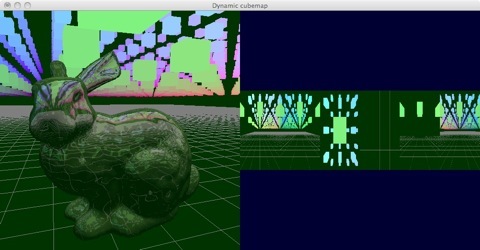 We then access the cubemap using GLSLs reflect and refract methods; both require the normal vector. The diffuse colour is calculated using the phong dot-product formula. Finally, we mix our colour based on reflectivity and refractivity. (And I just noted that you might want to adjust the outgoing alpha value depending on the transparency). This method is good for nice-looking reflections/refractions but suffers from some problems. First, there is no self-interaction, that is the bunny will not reflect or refract itself. This issue can only be solved by either subdiving the geometry further and -- in the extreme case -- have one environment map per triangle or by ray tracing. However the lack of self-reflections is usually not noticeable. Secondly, the underlying idea of environment maps is that everything stored in the environment map is at an infinite distance which is clearly not the case in dynamic environments. 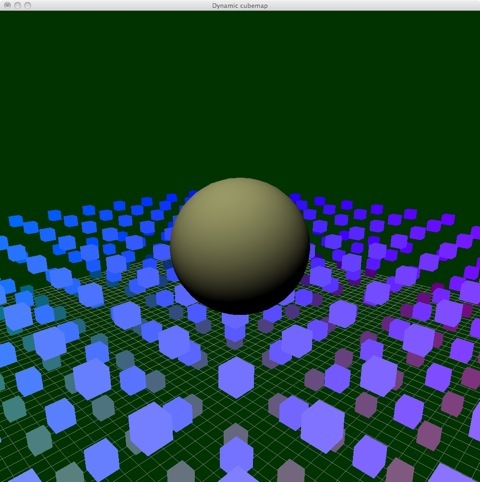 Similarly, the cubemap creation collapses the geometry for which the cube map is created into a single point. Curved reflections are therefore not really possible.